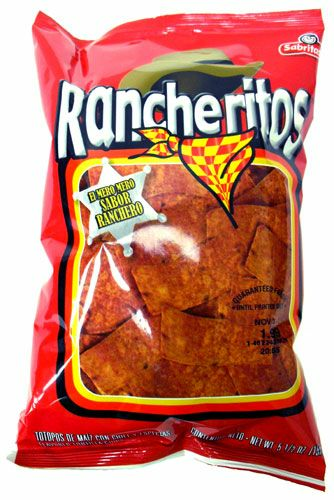 Try Rancheritos a Mexican style Corn Chips Snack with Chili and Spices by Sabritas from Frito-Lay. Rancheritos totopos. El mero mero sabor Ranchero - Prueba los deliciosos Rancheritos - totopos de maiz picositos. El mero mero sabor ranchero. Fritos Rancheritos con chile y limon. Rancherito. Rancherito's. I have answered and submitted a survey from byzarte and told them about open bags - they told me they couldnt do anything about it: My order of 3 bags of chips 2 were opened - they were all over the box - didnt want to touch open bags -I still have open bags dont want them. This product is very good! My kids got addicted to Rancheritos when we lived in El Salvador, so I buy them for special occasions. This Christmas, they opened a bag to share with with the grandparents, aunt, uncle and boyfriend. Now everyone is addicted. The lime and little bit of extra heat makes these so much better than the usual tortilla chips. I really love Rancheritos. I grew up in Mexico eating them and after moving I found them here and was very excited. These are still delicious, don't get me wrong, and if you don't know any better, you wouldn't be able to tell the difference. However, if you know the Mexican ones, then these are not the same. Tried theses in sabritas fiesta mix and there like doritos but bolder.Try these with jarritos mexican cola witch is available here at mexgrocer and taste the rancheritos flavor of Mexico. Be sure to try sabritas fiesta mix whitch is also avilable here at mexgrocer. ProsGreat in sabritas fiesta mix But I haven't tried A bag of just rancheritos yet but will do soon if there as good solo as they are in a mix then what a treat wow !! Im a huge fan of Rancheritos, the authentic ones from Mexico, this is not authentic, not even close. I was going to rate it a 1 but they are OK tasting, they taste like the Tostitos Chips from Mexico. ConsDoesnt taste anything like the Mexican Ranheritos from Mexico. Tried these today for the 1st time. They're pretty good. They have a pretty good flavor to them. I wish they had more heat to them though. These I've only tried once and are not bad!! I put some of my hot sauce on them or on the side and are even better!! Of course the Xxtra flamin Hot Cheetos top these and are like my top favorite so far!! But these have a pretty unique flavor and are pretty good!! Siempre que puedo compro mis bolsas de rancheritos para tener en mi casa por eso del antojo!! 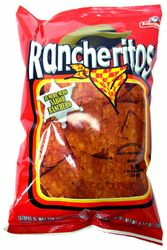 I've always loved Rancheritos and some years ago the Doritos Ranchero came out in the U.S. which were the Rancheritos replica. I guess they weren't too popular because they're no longer available at stores, at least where I live. I've been craving for some Rancheritos and I found this site. I was a little iffy at first but they are good. They're the real thing. The price is not that bad but once you add the shipping costs it becomes a little expensive. But it's worth it if you're craving for them! I'm now telling all my friends about this site and how they can get some real and fresh Rancheritos! I went to Mexico in 2006 and brought a couple bags of these back to Boston. I wish we had them here.I cant believe I found a site that has them. I've loved these since i was a kid!! They are delicious!